The Templar armour made entirely of steel with brass inserts and mounted on an elegant wooden stand (the photos shown are in the stainless steel version). 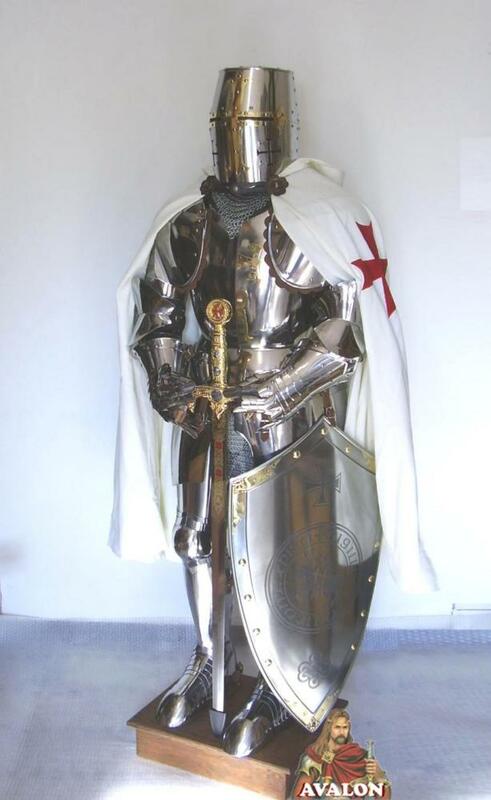 The Templar armor is wearable, are not included in the price: the Templar sword, shield and cloak that can be purchased separately on request. The parts of the armour can be fixed with strong leather straps and buckles. Thus this armour is size adjustable. 1- Great helm or heaume, closed Helmet manually made of carbon steel wearable, used to heavy cavalry in the late middle ages (thickness to choose: 1.2 mm, 2 mm). 2- Cuirass part of the medieval armour to protect the torso and back, made of Pectoral and back armour. Cuirass is made to your measures to be indicated in the order (chest circumference at breast level, total height and weight). 3- Pauldrons (Spaulders) to protect shoulders, this part of the armour covers the back; the shoulder straps are anchored to cuirass via leather straps. 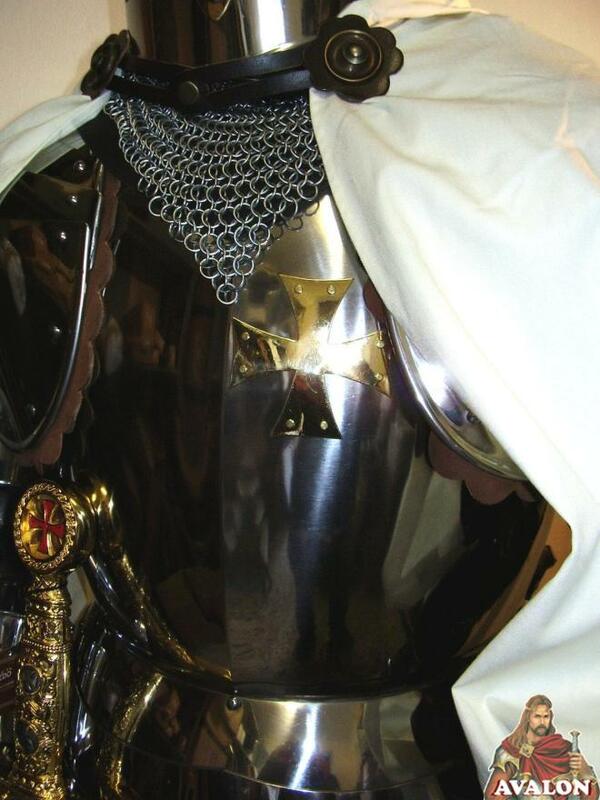 4- Armour to protect the arm, consisting of three parts: the upper cannon (forearm protection), the cubitiera (elbow protection) with lateral wing and lower cannon . They are articulated between them via hinged plates, arched and set by sliding rivets. 5- Medieval Gauntlets, medieval gloves to protect hand and wrist. 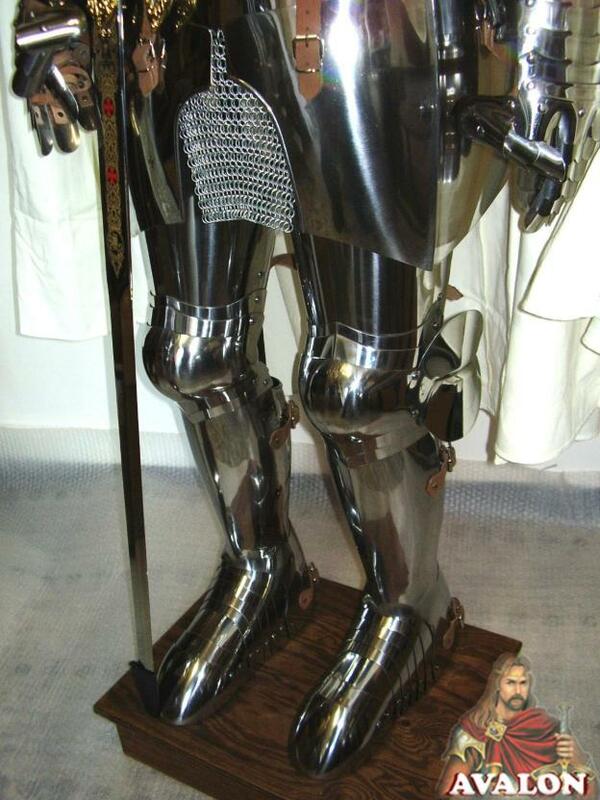 6- Poleyn, Schynbald (greaves), medieval Cuisses items of armour that protects the leg, articulated in such a way as to give maximum mobility to the fighter. 7- Sabaton armor or Solleret - Articulated shoes in defence of the foot with the end of different formats of your choice, shoes are made of cold rolled steel. - Material: 1 mm - 1,2 mm - 1,5 mm (19 ga -16 ga) Steel. - Indicate the measures: height of the person, weight, chest, head circumference. - Dimensions: (185 x 85 x 43 cm) 6-1/2 foot . 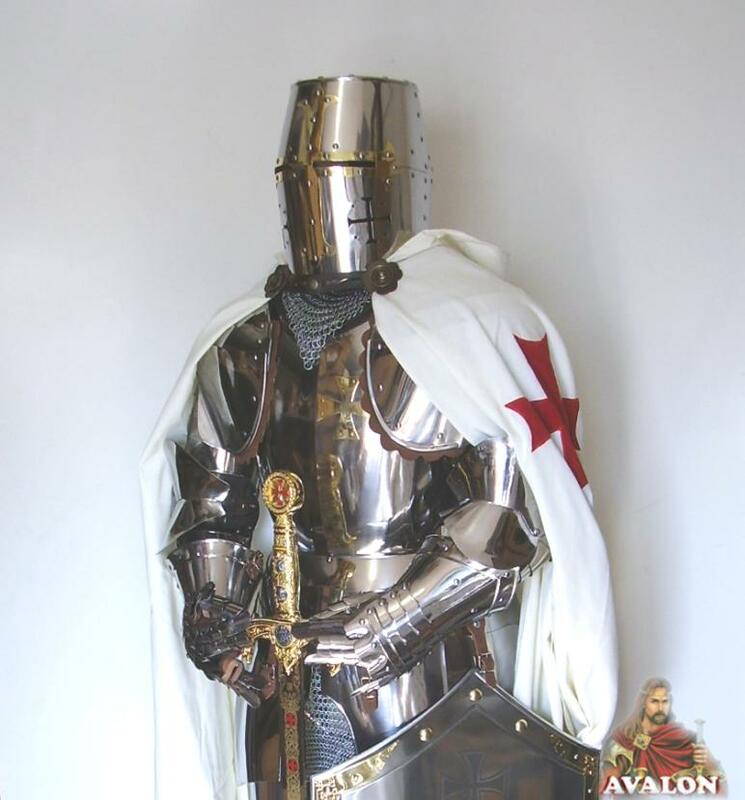 Templar Armour is produced by highly skilled artisans in Italy, equipped with leather straps and external adjustable buckles to be worn..
Templar Sword with scabbard and belt, double-edged steel blade, in which sharp narrowing towards the tip, the effective blows rapier. 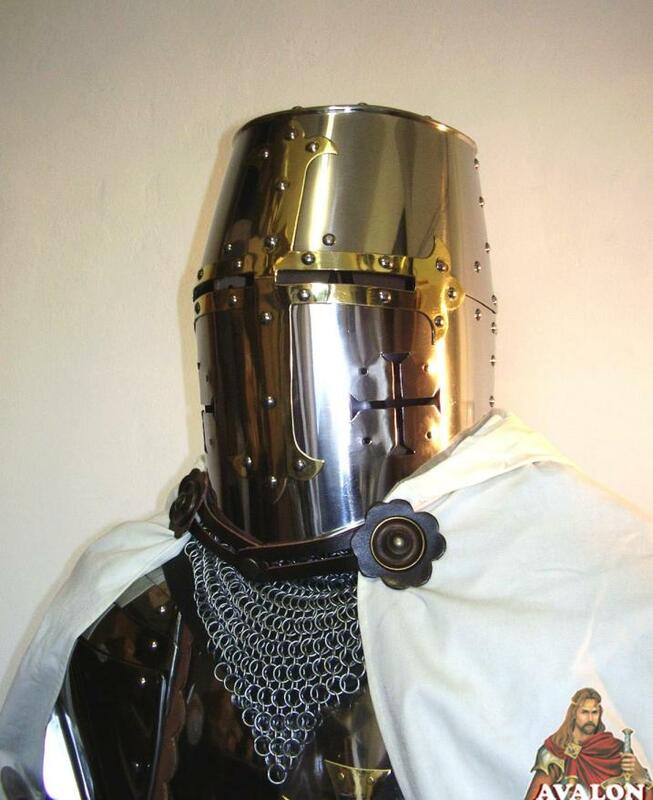 Medieval armor period 1440, helmet with great Bascinet French; armor made of steel handmade with wood base. 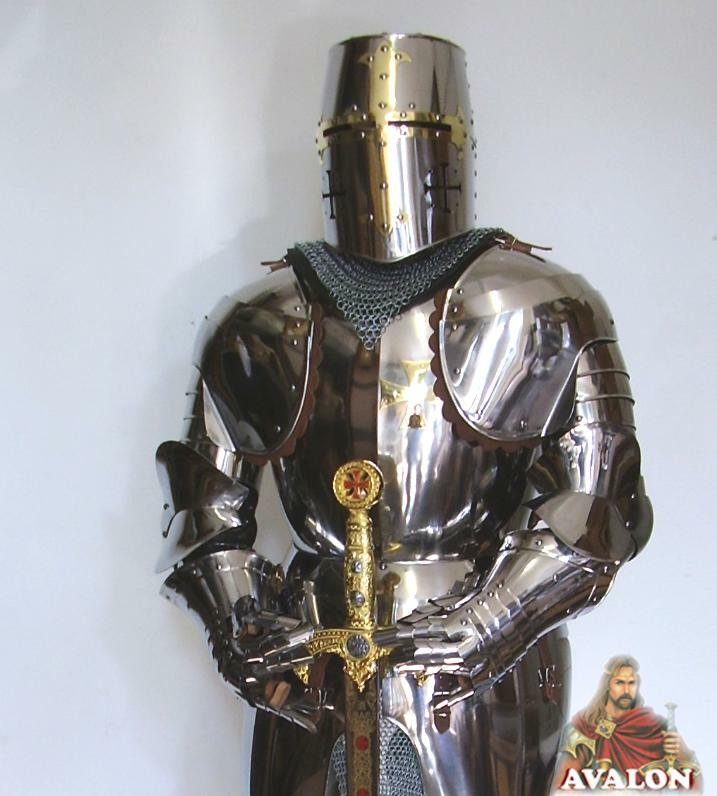 Medieval armor ideal for historical re-enactment and the medieval tournaments. Leather Muscle breastplate, brown, breast plate is made from robust cowhide leather. This type of armour was worn in antiquity by Greeks and Romans. Cloak Templar cotton. 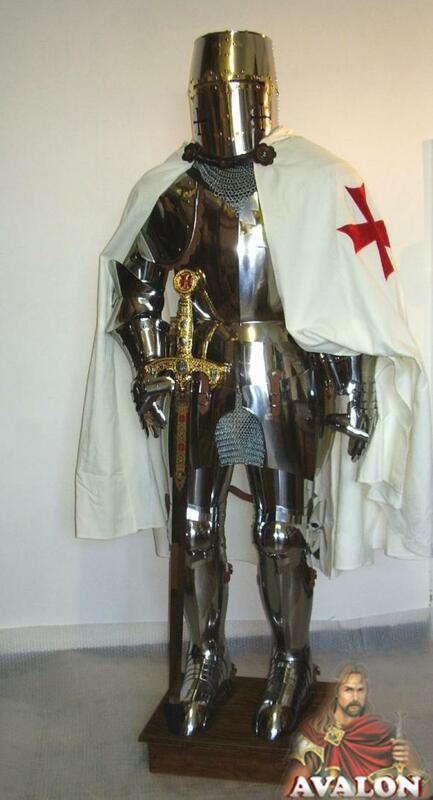 Traditional clothing of a Knight Templar. Standard size. Oval shield flat profile of the type used by the Roman Auxiliary Infantry. Greek Bust Leather Armor covers, belt and greek helmet, armor that was adopted by senior officers, has many different sizes. Roman shield made of wood and brass, rectangular introduced from the first century AD and used until the third century, dimensions: Height: 107 cm. Length: 59 cm. bending radius: approx. 23 cm. Reconstruction of a legionnaire’s gladius, the sword was a weapon that came to the Roman legionnaires. Total length 80 cm. Weight of the sword: 1.2 kg. Weight 0.7 kg sheath.